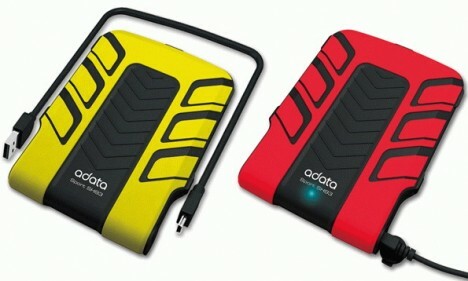 Targeted for users who work in rough conditions and need a more solid, tough and durable hard drive, the Taiwanese manufacturer, A-DATA, has brought in a new ultra-durable and rugged portable hard drive, SH93, which is both shock and water proof. This rugged gadget complies with IEC 529 IPX7 waterproofing and MIL-STD-810F military shock resistant standards. It can work underwater for 30 minutes up to a depth of 1 meter; it is also shock resistant when dropped from low height to the floor. A-DATA SH93 is fully rubberized with hard rubber and features a wrap-around USB cord that can work under various rough conditions. 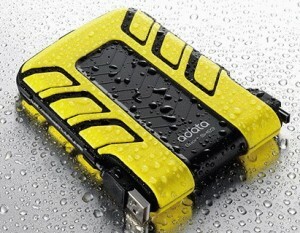 This ultra-rugged portable drive is available in 4 capacity versions: 250GB, 320GB, 500GB and 640GB. Measuring 129×97×19.2 mm in dimensions and weighing about 240 g, the A-DATA SH93 should be useful for people who are on the go or who need to rough it out. There is no detailed pricing revealed yet at this point of time.